In case you missed it last week, I posted my 2018 Summer Reading Guide, which is chock full of awesome books for summer that I’ve already vetted. Today’s Most Anticipated Books of Summer 2018 list focuses on upcoming releases that I’m excited about, but (for the most part) have not yet read. I hope I’ll be adding many of these to my Summer Reading Guide as the summer goes on. 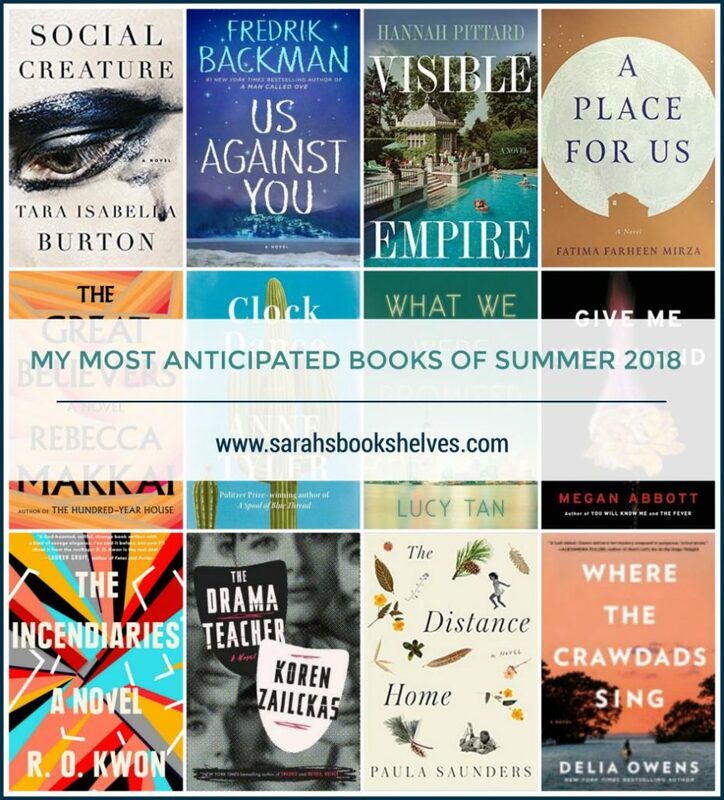 My Most Anticipated Books of Summer 2018 list is mostly made up of books from trusted sources (to find your personal trusted recommendation sources, check out this post and free downloadable template) who, in as many cases as possible, have already read the book. I did not look at a single publisher’s catalog to create this list. I’m sharing the recommendation source for each book and will specify if that source has or has not read it yet. I’ve read this one and it’s intriguing, addictive, and extremely messed up. It’s super dark and definitely not for everyone, but I’m still thinking about it over a month after reading it. It was also my #1 “Intense / Fast-Paced” pick on my 2018 Summer Reading Guide! Recommendation Source(s): Already read by ME, Tyler Goodson (manager at Avid Bookshop in Athens, GA), and Annie Jones from From the Front Porch podcast. The sequel to Beartown (my review), one of my favorite books of last year!!! This is probably my most anticipated book of the entire year. Beartown reminded me so much of Friday Night Lights and Us Against You sounds like it picks up about where Dillon was split into East and West. Recommendation Source(s): Trusted Author and already read by Modern Mrs. Darcy (2018 Summer Reading Guide) and Jan Belisle (blog reader whose taste I generally agree with). I love novels based on real events and this one reminded me of a less epic A Man in Full by Tom Wolfe. I also loved Pittard’s 2014 novel, Reunion. Recommendation Source(s): Trusted author and already read by ME and Modern Mrs. Darcy (2018 Summer Reading Guide). I love complicated family stories and this one sounds like a good one. I read the sample and was immediately intrigued. The author is only 26 years old and this is her debut novel! It’s also the first acquisition by Sarah Jessica Parker’s imprint at Hogarth. Recommendation Source(s): Already read by Modern Mrs. Darcy (2018 Summer Reading Guide). I’ve never read Rebecca Makkai before, but have heard she’s kind of extraordinary. One of my best recommendation sources rated this one 5 stars! Believe it or not, I’ve never read Anne Tyler. But, women’s reinvention journey novels have been totally appealing to me lately and Tyler Goodson, one of my top recommendation sources, rated this one 5 stars. I’m a sucker for family stories and the Shanghai setting of this one especially intrigues me. I’m super picky about my psychological thrillers, but Megan Abbott is one of my most trusted authors. She writes demented high school girls better than anyone I know. I loved The Fever and You Will Know Me and this time around she tackles the world of science. Annie Jones got me interested in this one when she talked about it on Anne Bogel’s What Should I Read Next? podcast…she said the writing is gorgeous. Plus, R.O. Kwon was one of Bookpage’s 11 Women to Watch in 2018. Catherine at Gilmore Guide to Books (one of my most trusted book bloggers) loved Zailckas’ debut novel, Mother, Mother and I’m always on the hunt for new-to-me psychological thriller authors. Gracie Mueller seems like an average person. […] But she has a lot to hide—she’s not even a US citizen—and when Randy’s failing career as a real estate agent makes finances tight, he leaves town for a better job, their home goes into foreclosure, and Gracie turns back to the creatively illegal lifestyle of her past to keep things afloat for her kids. An expert in fake identities, she becomes Tracey Bueller, who later becomes Mariana DeFelice. […] After a deadly stint upstate when a friend asks too many questions, she leaves town for New York City, finding her way into the best school in Manhattan for her kids, where she gets a job as the drama teacher. But as she struggles to keep her web of lies spun taut and her secrets hidden, more questions about her past are raised. I’m a sucker for a good family saga and Tyler Goodson, one of my top recommendation sources, rated this one 5 stars. I love a coming of age story that has a bit of mystery and the North Carolina marsh setting of this debut novel grabbed my attention (I’m secretly hoping she’ll remind me a bit of Pat Conroy). PS – Owens is a biologist and wildlife writer. Recommendation Source(s): None – I received an ARC of this from the publisher and the description caught my attention. What Sumer 2018 books are you looking forward to? A wonderful, thoughtful list, Sarah. It’s not surprising that half your books are also on my list, but I’m happy to see some others here that I will need to look at a little closer. I think I saw Where the Crawdads sing on Southern Living’s list for summer, and being that it’s a COA story, that one has definitely piqued my interest. I’m very excited about Clock Dance, too. I’ve read a lot of Anne Tyler and some of her books I’ve loved, while others have been DNF’s, but this one sounds so good. Definitely not surprised! Glad to hear you’ve liked even some Anne Tyler..I’ll be interested to see what I think! Thanks for the recommendations! Some of these are on my TBR list already. I’m currently trying to catch up on the Fredrik Backman books I have sitting on my shelf. I haven’t read Beartown yet, but I did just finish Britt-Marie Was Here. I loved it. Great list! I’m definitely intrigued by Social Creature, and Us Against You is a must-read for me. I liked Makkai’s The Book Borrower, and I was also a fan of Zailckas’s Mother Mother, so I’ll have to look into the new ones by those authors as well. Oooh, Clock Dance is new to me; I’m going to look for it! This is such a great list; excited to get started with Visible Empire. I’m SO excited for Us Against You!! Beartown is one of my favorites. I hadn’t heard of some of the others but The Drama Teacher sounds great too! A wonderful list as always! I’m particularly interested in A Place for Us, which sounds right up my alley — the trope where a huge sprawling family has to get together for a major event is one of my favorites in literary fiction. A few of these jumped straight onto my TBR 🙂 I have read two of Rebecca Makkai’s books and think she’s wonderful, so I’m eager to read her new one soon. I’ve been less impressed with Anne Tyler’s recent books compared to her classics (Dinner at the Homesick Restaurant, which I read last year, is extraordinary, and I also love The Accidental Tourist), but I will give Clock Dance a try. I started the Makkai yesterday and really liked the very beginning! But, then my ARC of Us Against You came in and I had to jump to that…but I’ll definitely come back to the Makkai! Great list Sarah! I’ve already read Us Against You and just starting A Place For Us. A few others are already on my shelf or on my tbr. And a few will be added now. I like Anne Tyler, although not consistently, and Megan Abbot is one of my favorite authors. Thanks! You’re the second person that’s said Anne Tyler is inconsistent for them. I’ll be interested to see what I think. If you’ve never read Anne Tyler, I suggest you go back and read Dinner at the Homesick Restaurant and not The Accidental Tourist.